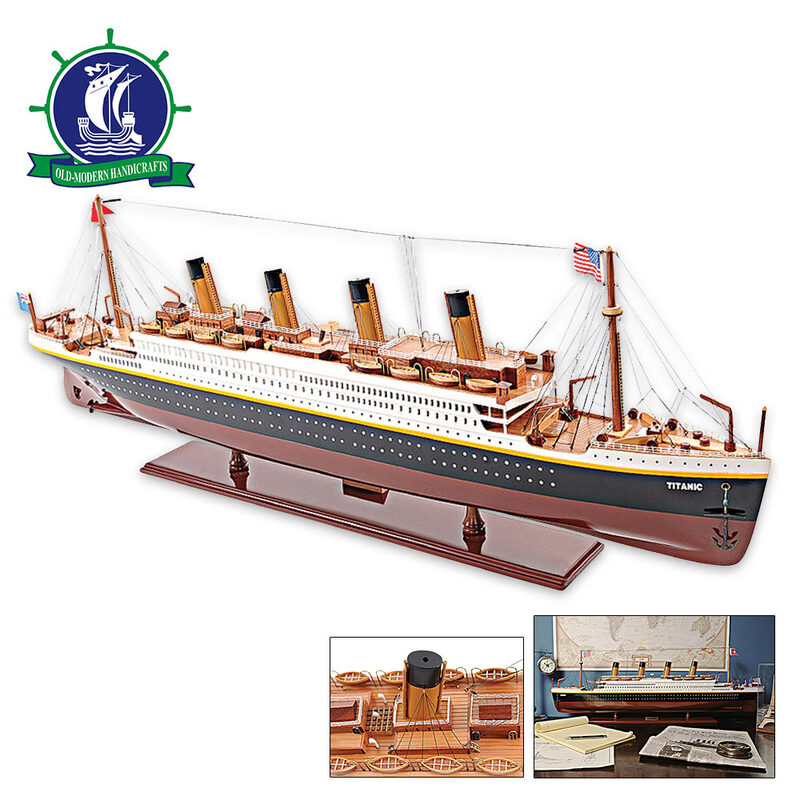 Handcrafted RMS Titanic Model on Display Stand | Historically Faithful Design, Details | BUDK.com - Knives & Swords At The Lowest Prices! 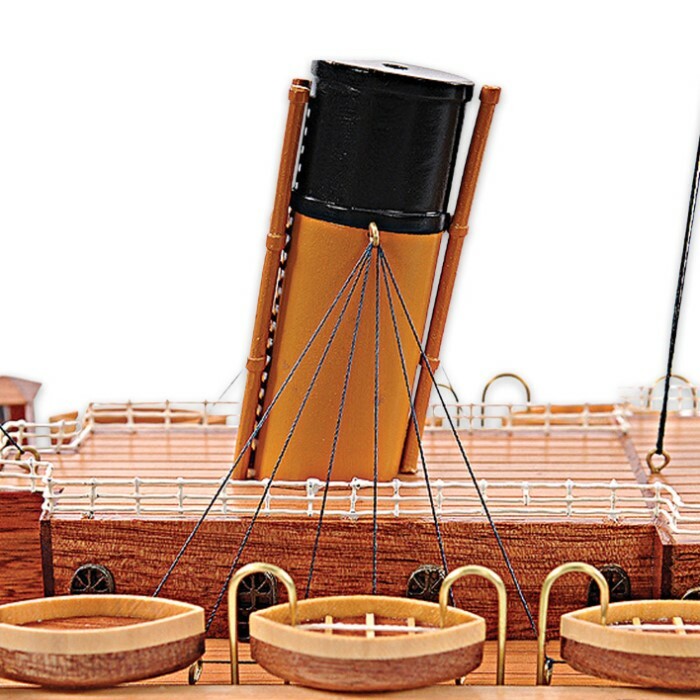 Exquisitely appointed and impressively sized, our handcrafted RMS Titanic model flawlessly mirrors the legendarily large, tragically doomed steam luxury liner that set out from Liverpool and sank in the Atlantic after colliding with an iceberg. Master craftsmen painstakingly toil for more than 50 hours painstakingly handcrafting each model using rosewood, mahogany, teak and other beautiful exotic woods. Each Titanic model is designed perfectly to scale using original plans, pictures and drawings as references, and model builders employ various time-tested construction methods to ensure every model is sturdy and immaculate. Using the "plank on frame" method, craftsmen carefully wed each strip of wood to form a smooth, seamless hull. A historically faithful paint job and clear coat of varnish follows, as do countless intricate details that yield a level of realism that is nothing short of spectacular. "Titanic" and home port "Liverpool" are painted on the hull. Plank decking, metal rails, multiple life boats, davits, metal stairs, painted smoked stacks, anchors, advanced rigging, and US, UK and White Star Line flags are just a few of the myriad fine touches that make our Titanic model so extraordinarily lifelike and special. Only the finest woods and quality metal alloys are used in its construction - absolutely no plastic parts. 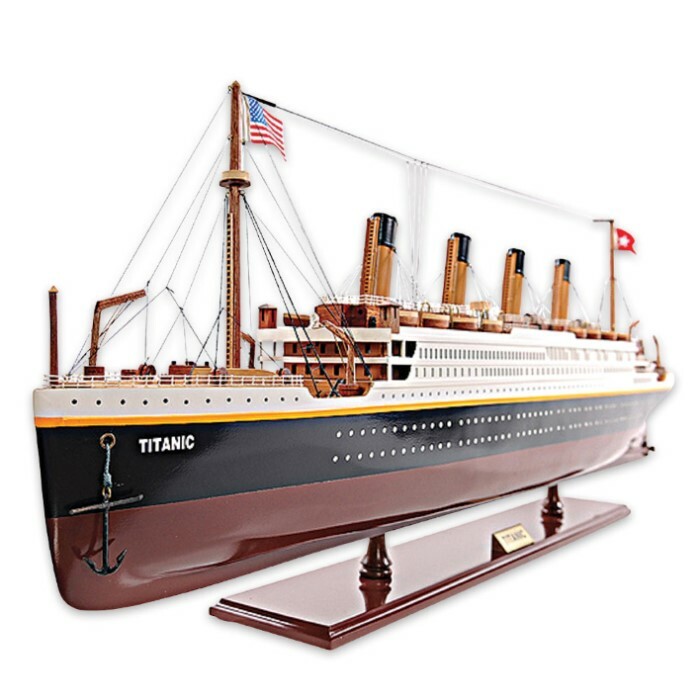 The model comes fully assembled and ready for display, attached to a wooden display stand with an elegant brass nameplate engraved with “Titanic.” At 25" long x 3 1/2" wide x 10" tall, our breathtaking RMS Titanic model is sure to be the awe-inspiring centerpiece of any room or space. Ships directly from manufacturer.